What SendGrid Triggers and Actions are Supported? Recipient Newsletter List - Triggers when a new list is added. Send Email - Send an email to one recipient. 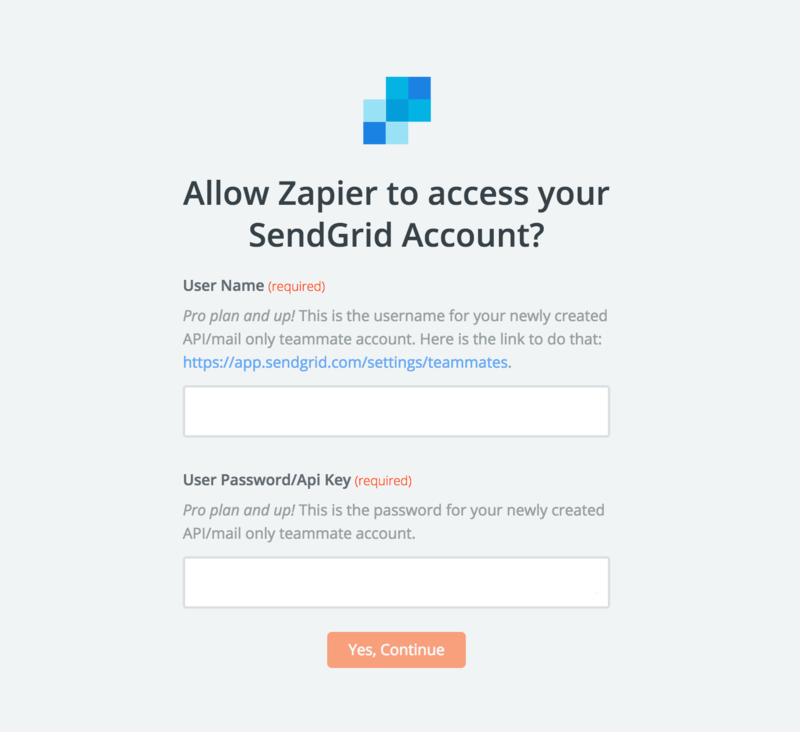 To get started with Sendgrid on Zapier, first you will need to click to connect your Sendgrid account to use with your Zap. You must be on the Pro Plan or higher to use Send Grid. Next you should then enter your Sendgrid account password in the field labeled "User Password/API Key", and your username in the field labeled "User Name". You can also create new credentials with an API key to connect to Zapier instead of your password, which is best for security with team accounts. Open Sendgrid's teammates page from your paid account and copy the key from there. Paste your credentials back into your Zapier account and then “Continue”. If your API key was entered correctly your Sendgrid account will now be successfully connected. Yes! 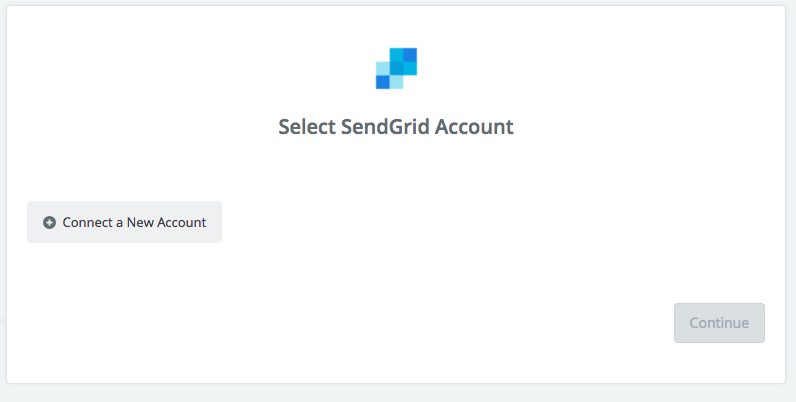 SendGrid's "Send Email" action supports HTML messages. We currently don't have attachment support for SendGrid at this point in time, but will hopefully be able to add that kind of functionality in the future. 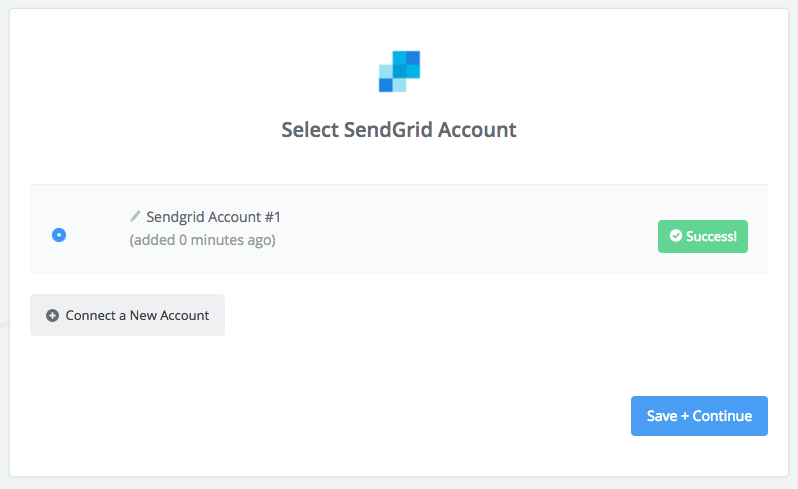 1) The SendGrid account is a trial account- these won't be able to connect to Zapier. Only Pro Plan and higher accounts can connect to Zapier. 2) Make sure you're using the credentials listed at https://app.sendgrid.com/settings/credentials (If none exist, you'll need to create one). This is separate from the API Keys menu within SendGrid. 3) Does your password have any special characters in it (like $ # & etc)? Sometimes these get stripped out. Try a password without these special characters.